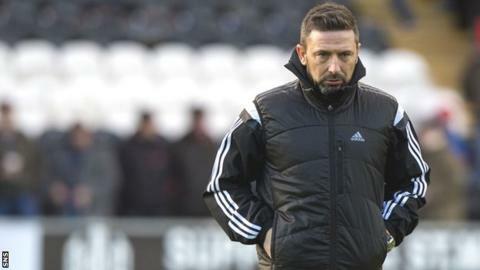 Manager Derek McInnes hopes the experience of winning the Scottish League Cup last season will help his Aberdeen players retain it. The Dons beat Inverness last March to lift their first trophy since 1995 and that could aid the Reds in Saturday's semi-final against Dundee United. "I think having won it helps us in terms of trying to be successful again," McInnes told BBC Scotland. "I don't need to paint the picture of what the celebrations could be like." Ahead of the Hampden game against their New Firm rivals, the Dons boss continued: "We are well aware and to our support, and how it felt for the players to lift that trophy. "For me, it is important that they experience that again. "We feel that, with a big crowd, having won the trophy last season and hopefully getting the experience of that, and with the team coming on again in another year, we are confident going into the game but also respectful of who we are playing." McInnes is an admirer of United, describing them as "excellent" in another BBC interview. He enjoys the so-called New Firm rivalry, claiming "it always adds weight to it when both teams are doing well". "In the last couple of seasons there has been improvement with Dundee United and ourselves," he said. "Both teams have that history and the demand from the support to be in the fight for trophies. "We feel they have players who can change a game in a minute. You really need to concentrate. You have to keep their better players quiet but still try to impose yourself in an attacking sense. "We just want to put in a strong performance. If we do that, we can win the game." McInnes argues that, despite the absence of Rangers, Hibernian and Hearts from the Scottish Premiership, there are are "a lot of good stories that sometimes get forgotten about". "It [Rangers, Hibs and Hearts being in second tier] gives everybody an opportunity to try to challenge," he continued. "I think a lot of teams of late have improved - St Johnstone, Inverness, Dundee United, ourselves, Hamilton." Aberdeen's preparation has been hampered by an injury to imposing defender Ash Taylor, but McInnes was swift to bring in a replacement in Donervon Daniels from West Brom. "When Ash got injured last weekend, we knew we had to act quickly," said the manager. "I think we've got a good player in Donervon and I'm sure he'll enjoy his time with us." A move to bring left-back Graeme Shinnie to Aberdeen from Inverness before the season ends, as has already been agreed, looks unlikely, with McInnes saying: "He's an Inverness player and we respect that but we look forward to working with him in the summer."